Team App - Your Team, Your App. Create an iPhone and Android app for free for your sporting club. Get the app and log in or sign up, or scroll down for more. ... to access Team App from the web, or scroll down for more. Team App is a platform that allows teams and social groups to improve communication by creating their own smartphone app. Design your app, choose from a huge range of features and you will have a fully functional Team App created in less than 10 minutes. Upload your team logo, select a color scheme and choose the features to display in your app. Publish news to all members or specific access groups. Get notifications and reminders about key dates in your team’s calendar, even RSVP to events! Members receive push notifications when news, events, photos, and teams are published. Publish your roster or team selection including maps for ground location. See who’s available for team selection with availability dates and player information. Promote commerce within your Team community by listing a directory of your members. Discussion groups can be created and displayed. Great for making your app more social. Sell merchandise, memberships and more directly through your app. Display player photos, details, bio and more. Includes optional player sponsor. 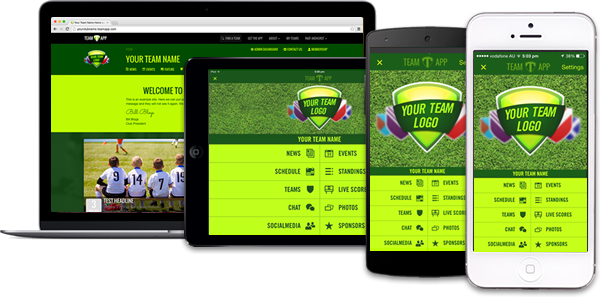 Team App is the hub for all your club’s information and communication needs, sending instant push notifications to the smartphone or tablet. Manage members, send news, create events, upload photos & videos, publish newsletters and much more. Easily link the app to existing club websites or social media channels. Categorise your members into groups to improve communication with players, parents, coaches and your whole team community. Your content goes securely and privately to the relevant members. Your Team App can be viewed on any iPhone or Android device, and a website version that updates dynamically with your app is automatically created! Receive news and information about your team. You will receive push notifications whenever a team admin posts something new. Get notifications and reminders about key dates in your teams calendar, such as presentation nights and social gatherings. Link to a website, upload a PDF or manually enter your schedules for the team. Also has RSVP and send reminder alerts! Links through to the web address (URL) or PDF that displays the standings/ladders for your team. Link directly through to a web address (URL) for your sporting associations live scores feed, or select manual entry mode and any member of your app can enter live scores as they happen! Display the teams for upcoming games. Send team announcements or simply list your playing squad. You can also add contact details and maps to game locations. Create chat rooms, forums, send group messages or one to one private messages! This is a great way to add a social element to your App, photos and video can also be uploaded and shared within chat rooms. Photos are a great way to add a social element to your App. When sending a photo in your App you can choose which access groups will be able to view that photo. Availabilities are a great way to keep track of players, as it allows a player or club admin to enter a range of dates a player is or is not available. Follow all your teams social media accounts. Link to Twitter, Facebook, Instagram, Google+, Pinterest, YouTube, LinkedIn or any other website. Allows you to accept payments or sell items relevant to your club. These might be membership fees, team merchandise or tickets for a fundraising event. Custom weblink buttons allow you to link through to any website you choose. E.g. link to a stats page, team blog or any 3rd party website! Members can generate business opportunities by listing their occupation details in your Team App members directory – encouraging commerce between your members. Administrators have the option of requesting player emergency contact details or medical information, enabling quick access in case of emergency. Display player photos, details, bio and more. Including linking to player stats website. Switch on optional player sponsor promotion to help generate extra revenue for your club. Upload pdf documents to display in your App. These could be reports, forms, general notices or any document. Track your players attendance at training, games or events directly from your team app. Full administrators can also generate attendance reports from the dashboard. See video. Members details and email addresses can be imported in bulk and automatically assigned an access group. Parents can also be aligned to children! Assign members to submit votes for best players. Select opening and closing times. Voters will receive push notifications reminders to vote. Bring your App to life with videos. With Team App Video your members who can’t make the game no longer have to miss all the action. Event ticketing provides a simple & secure way to sell tickets for club events such as trivia nights, game-day entry or fundraisers directly via your app. See video. Survey your members with easy options for multiple choice or free form replies. Share your responses or keep them private! Team App regularly releases exciting new features based on feedback from our clubs, so please e-mail us on what you’d like to see next at feedback@teamapp.com. 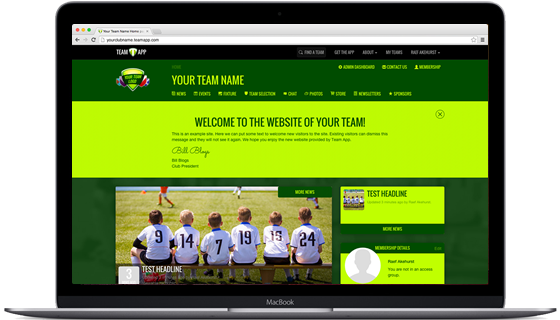 Creating your Team App also creates a website that dynamically updates with your App. Team App has received in excess of 10,000 reviews on the App Store and Google Play. Over 65% of these reviews are 5-star and 26% are 4-star. Team App appreciates the feedback and we are very proud of how much everyone loves our app! This app is the best thing since the invention of Rugby! I use it every day…5-stars for sure!! Love the app! Easy to set-up and the best thing since sliced bread. Fantastic app. Made my life immensely easier as a Team Manager. Thank-you! Fantastic app! Excellent source for teams to communicate. Fantastic resource for group communication and scheduling. Very flexible configuration with accompanying website too. Love it!! Team App provides an essential service for community groups to share their information. It can’t be faulted. Well done! Never expected anything like this. Simply AMAZING! Love this app! Only wish I knew about it years ago!! Love the convenience and ease of communication. Click here or visit teamappadvertising.com Advertising made easy! Turn your app into an opportunity to raise funds and increase sponsor value. Contact us to find out about the benefits of partnering with Team App. Team App was proudly designed and developed in Melbourne, Victoria, Australia. Visit https://www.teamapp.com.